First of all for this week’s review, please forgive me if I accidentally give the name of the game as Constantinople sometimes, I’ve spent way too much time listening to They Might Be Giants. But this review is about Istanbul which, since we’re talking about the game, was never Constantinople, unlike the city Istanbul, which was. Confused yet? Good, then lets talk about the game Istanbul, which has the advantage of not being very confusing at all. 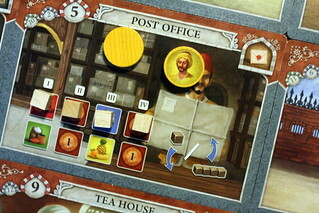 At least considering the rules, it is a very straightforward game about trading in the bazaar of Istanbul. You, the player, are a merchant that, for reasons unknown, conducts his daily business from a wheelbarrow he pushes through the streets. You are followed around by a swarm of assistants who, as far as anyone can tell, do all the real work. If you arrive at one of the 16 locations of the bazaar, you must either leave one of your four assistants behind or reunite with an assistant you previously left there, only then may you use the location’s action. Since you’re utterly lost without them, managing your assistants is one of the big challenges in Istanbul. Your goal as a merchant of Istanbul is to collect rubies because … well, it’s not really all that clear why all the merchants are obsessed with rubies. We have our own theory, but there’s no indication that the gems will really buy you into an even richer merchant family. How you acquire those rubies also isn’t so much about trading. You have four different types of goods you carry on wheelbarrow, but you’re not trading with them. When you go to one of the three warehouses (Fabric, Spice and Fruit), you fill up the matching compartment of your wheelbarrow and don’t pay a thing. That’s the way I like to do commerce. You also don’t strictly speaking sell any of those goods. You can deliver them to the Sultan’s Palace, and he’ll reward you with a ruby. But with each delivery, his demands rise and the next player to go there has to bring one more thing to get his reward. Or you could take your goods to one of the two Markets were you do something almost like selling them. The Markets don’t pay you for goods delivered at market price but for delivering the right set of goods for the current demand, shown by a stack of tiles on the market. The more matching goods you deliver, the more money you receive. And a good use for that money is to take it to the Gemstone Dealer and buy a ruby. That’s the closest thing to an economic transaction in ConstantinopleIstanbul you buy gems, and with each one bought the price increases. Those are the reasonable ways to acquire rubies. Lets talk about the unreasonable ones, and I don’t mean mugging someone in the dark alley. We’re getting to the criminal cousin in a moment, but it’s not his time yet. For now, I mean the rubies you can get from the Mosques and, of all places, the Wainwright. The two Mosques each sell two different bonus tiles. They are nice bonuses, like getting a fifth assitant, or the ability to buy an additional good of another type when filling up at a warehouse. Those things can be understood as blessings you receive in return for making donations. Okay. But why do you get a ruby when you buy the second tile from one mosque? Even more unusual is the wainwright, however. You buy extensions from your wheelbarrow from him that increase your capacity to carry goods. Forget for a moment the question how you would extend a wheelbarrow, I imagine it’s some kind of trailer. But why does he give you a ruby when you bought the third and last extension? That’s a rather expensive gift, even for a very valued customer. The remaining locations come under miscellaneous. The Black Market is the most common way to gain the elusive blue goods, jewelry, for which there is no warehouse. Getting them does, however, depend on your luck with a dice roll. The same goes for the Tea House where you can bet on a dice roll and win some money. 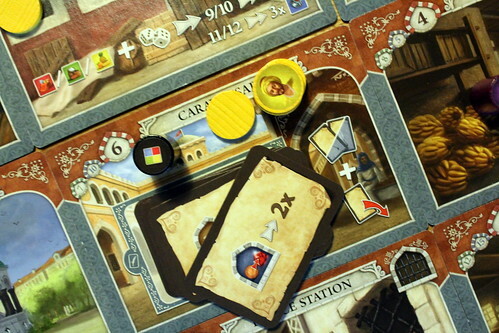 The Post Office lets you take mixed goods and coins (rotating with a clever mechanism that has you cover/uncover goods in turn) and at the Caravansary you can get cool and powerful Bonus Cards. At the Fountain you can gather your assistants without collecting them one by one. How do they know when to gather? Cell phones, probably. But the most fun location is the Police Station where you can free what the manual calls your “family member”. We affectionately call him Crazy Cousin Ahmed. Dropping by the Police Station lets you get him out – without bail, I might add – send him anywhere in the city and take the action on that tile without you being there. That’s useful for multiple reasons: Ahmed is not restricted by the same movement rules as you, he can move wherever you want him to while you can only travel to steps per turn. Ahmed doesn’t need a witness, I mean assistant. And Ahmed can use a location where another merchant is already present without paying. You would have to pay two coins to every merchant present, Ahmed is more sneaky than that. They are probably lucky to get out alive. On the other hand, any merchant moving on Crazy Ahmed’s location – any Crazy Ahmed but his own cousin – can get him arrested again, moving him back to the Police Station and receiving a bounty of three coins or a bonus card. You play Istanbul by moving around the city and taking actions on the spaces you stop, until one player has five rubies (six in two players) and wins. The mechanics are actually pretty cool, I enjoy playing. It’s just a shame that the theme is so paper thin that I notice it. 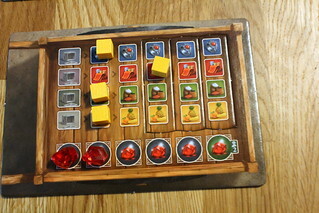 Playing so-called eurogames, a thin theme is something you get used to. It’s hard to make an interesting game where the mechanics match the theme. But somewhere between extensions to my wheelbarrow, getting rubies from the mosque and Crazy Cousin Ahmed breaking out of prison every couple of turns, Istanbul lost me on the theme. And why are we getting free stuff from the post office? Aging relatives sending spices? I also thought that the Fountain, where you can gather all your assistants again, undermines the game core mechanic. For a game where managing your assistants is supposed to be the challenge, getting them all back should at least have a cost. But I did say I was having fun playing, and I mean it. Istanbul is another game with very light rules but interesting optimization tasks to solve. Finding the shortest way to the rubies is fun, and more fun because the 16 locations can be laid out in any way you want, creating longer or shorter ways between locations that go well together. The recommended layout for the first game, with extra short paths, was actually too easy and I almost grew bored at that point. If you are an experienced player of boardgames, I recommend you start with a random layout or the long paths layout from the manual, both make for a much more interesting game. 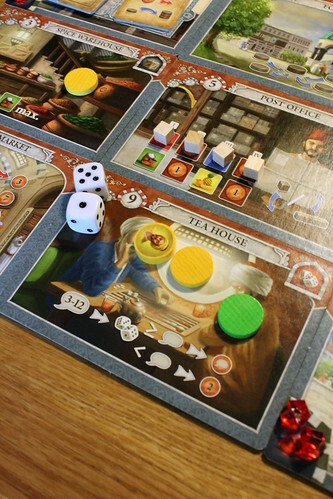 Based on those games, Istanbul lacks a little edge to be a great game, but it’s still a very solid and rewarding game, plays more quickly than most Kennerspiel des Jahres nominees and, not to omit that point, looks good.